Do I have to Lose My Self to Love You? | What Is Codependency? As codependents we lose ourselves in relationships, unaware that losing our Self is the greatest despair. When the relationship inevitably ends, it's devastating, because we are lost. We lack autonomy because that task wasn’t completed by adulthood. The struggle to achieve it is typical of codependent relationships. Often there are power struggles, characterized by repeated, unresolved arguments, either about a single recurring issue or numerous trivial things. Many of them boil down to the question of who has control, whose needs will be met, or how intimate they will be. Intimacy problems are a common symptom of codependency. Avoidance of intimacy, and the vulnerability that occurs when we open up, is a way to maintain control and autonomy. We fear that closeness makes us more dependent on our partner and exposed to being judged and hurt. These outcomes aren’t necessarily true, but hearken back to a traumatic or dysfunctional childhood when being vulnerable and dependent was unsafe. Some people feel unsafe both in and out of a relationship. The more we’re threatened by closeness and autonomy, the greater is the conflict in the relationship. Many codependents do fine on their own, but once in a relationship, the stages of codependency take hold. When there is “chemistry,” they overlook negative indicators that might be a warning not to get involved. It’s actually true that feel-good chemicals in our brain start to alleviate our emptiness, so that we want more of that drug. We don’t want to lose those good feelings. Hence, we become increasing preoccupied with and dependent upon our loved one. The desire to please can lead to obsession, denial about our partner’s behavior, and doubt about our own perceptions. Boundaries become blurred so that we don’t say “no” or set limits on what we’re willing to do or what we’ll accept from our partner. Not only that, confusion arises between what our partner feels and our own feelings. We feel responsible for them, too. If he’s sad, then I’m sad, too–as the Barry Manilow song goes. If she’s angry, it must be my fault. 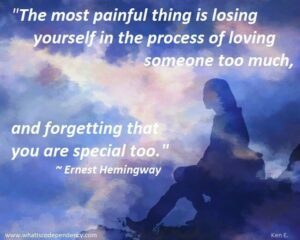 This is why codependency is a disease of a “lost Self.” (See Codependency for Dummies.) Because our identity is referenced externally, we prioritize our relationships above our self, not occasionally, which would be normal, but repeatedly. In important relationships, we dread losing our connection with others or their approval. With our partner, we sacrifice ourselves over and over in small and big ways―from insignificant concessions to giving up a career, cutting off a relative, or condoning or participating in unethical behavior that before would have seemed unimaginable. Symptoms of codependency are exacerbated when we’re in an authoritarian relationship, where decisions revolve around the needs and authority of one person. This is typical of an abusive relationship, where our partner makes explicit demands. When our partner is insistent, it feels as if we have to choose between ourselves and our relationship―that we must give up our Self to keep it. We become invisible, no longer a separate person with independent needs and wants, assuming we knew what they were. To please our partner and not make waves, we give them up and collude in sacrificing our Self. Our relationship might be with an addict or someone mentally ill or with a personality disorder, such as narcissistic, borderline, or anti-social personality disorder. These partners are manipulative and can be abusive or threaten abuse or abandonment when they don’t get their way or sense that we’re becoming more autonomous. Any act toward autonomy, such as setting a boundary, threatens their control. They will attempt to maintain power and authority with guilt, character assassination, gaslighting, and all forms of criticism and emotional abuse. If you had a controlling parent, this pattern may have been established in childhood and carries over into your adult relationships. You end up walking on egg-shells and living in fear that can traumatize your nervous system, with symptoms continuing after you leave. It’s essential to get outside support and seek counseling. Healthy relationships are interdependent. There is give and take, respect for each other’s needs and feelings, and are able to settle conflict through authentic communication. Decisions and problem-solving are collaborative. Assertiveness is key. Negotiations are not a zero-sum game. Boundaries are expressed directly, without hinting, manipulation, or assuming our partner will read our mind. Neither security nor autonomy is threatened by closeness. Vulnerability actually makes us stronger, not weaker. In fact, we can be more intimate and vulnerable when our autonomy and boundaries are intact and respected. Both partners feel secure. They want to maintain their relationship and allow for each other’s separateness and independence, and aren’t threatened by their partner’s autonomy. Thus the relationship supports our independence and gives us more courage to explore our talents and growth. In recovery, you will gain hope as the focus shifts from the other person to yourself, where change is possible. Raise Your Self-esteem, learn How to Be Assertive to express feelings, wants, and needs and to set boundaries. You’ll develop positive habits of self-care. Psychotherapy often includes healing PTSD, childhood trauma, and internalized or toxic shame. (See Conquering Shame and Codependency: 8 Steps to Freeing the True You.) Eventually, your happiness and self-esteem doesn’t depend on others. You gain the capacity for both autonomy and intimacy. You experience your own power and self-love. You feel expansive and creative, with the ability to generate and pursue your own goals. Codependency doesn’t automatically disappear if you leave a codependent relationship. Recovery requires ongoing maintenance. After a while, changes in thinking and behavior become natural, and the tools and skills learned become new healthy habits. Perfectionism is a symptom of codependency. There is no such thing as perfect recovery. Recurring symptoms merely present ongoing learning opportunities!